The Beatles’ music, movies and spirit provided inspiration for both the Monkees TV show and music. In the case of the Partridge Family, the family act The Cowsills was the spark that lead Screen Gems to conjure up a show based on a family group. The Cowsills were originally made up of four teenaged brothers who scored a top 40-hit in 1967 with “The Rain, The Park, and Other Things,” after their mother had also joined the group. With the addition of two younger siblings to their lineup, in 1968 they had three additional hits; this configuration of the group caught the attention of executives at Screen Gems. 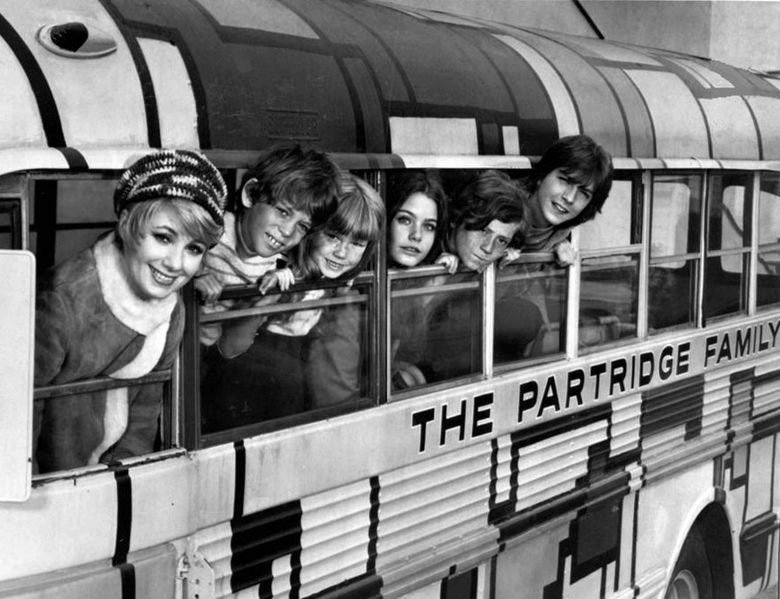 The folks at Screen Gems were so impressed with the kids in the group that they approached the Cowsills about the possibility of having the kids play themselves and perform on the program, but the family turned them down when they learned that Shirley Jones was contracted to play the role of the mother, and not Barbara Cowsill. Screen Gems regrouped and went on to hire four child actors with no singing ability to play the roles of Laurie (Susan Dey), Danny (Danny Bonaduce), Chris (Jeremy Gelbwaks), and Tracy (Suzanne Crough.) They also hired David Cassidy as Keith Partridge, who was given the job in large part because of his appeal to teenage girls. This turned out to be a savvy decision, because David became one of the biggest teen idols of the 70’s – if not of all time. In the pilot episode of the Partridge Family, a widowed mother of five children is cajoled by her kids to participate in their recording sessions in the garage, and is absolutely astonished as their first record, “I Think I Love You,” races to the top of the pop charts. In an interesting example of life imitating art, “I Think I Love You” also raced to the top of the real Billboard charts less than eight weeks after the song debuted on the show. David fought long and hard to sing on the Partridge Family recordings, and real-life stepmother Shirley Jones, who played his TV mom, also went to bat for him; he finally won the battle. (The only cast members who actually sang on the records – eventually- were Shirley and David.) It’s hard to imagine what those songs would sound like without Cassidy’s distinctive vocals. Of course, the brilliant pop songs were not recorded in a California suburban garage by a bunch of grinning teens and their impossibly pretty mom. The Partridge Family’s pop masterpieces were written and recorded by some of the best talent working in Los Angeles at time, including a group of superb studio musicians known as The Wrecking Crew. The show and the songs launched David Cassidy’s career as a bona fide pop phenomenon, which he has always professed to have mixed feeling about, as his goal was to be a rocker more in the mold of Jimi Hendrix. In any case, David kept a grueling schedule of filming the show during the week and playing concerts on weekends as well as during the show’s hiatuses. The show remained immensely popular during its four year run, and spawned an impressive number of hit records to boot. 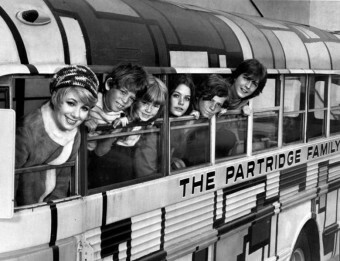 David Cassidy and Shirley Jones have both written entertaining and juicy books about their time on the multi-colored bus, and anyone of a certain age (*whistles*) will always have a soft spot for the Partridge Family, and the cheesy era that spawned them.